Mark Lazenby, Ruth McCorkle, and Daniel Sulmasy, eds. The study and practice of end-of-life care has seen an increasing understanding of the need for care that integrates clinical, psychosocial, spiritual, cultural, and ethical expertise. Yet, no one existing volume pulls together perspectives from a diverse array of religions with ethical dilemmas and clinical problems in view. 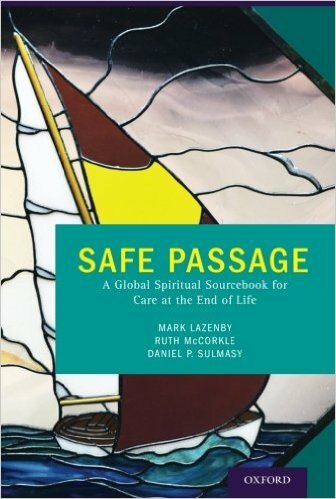 Safe Passage coaches clinicians and others on the front lines of care on understanding how to incorporate different traditions of thinking into the most difficult of moments around the end of life. The book is structured around five major moments of realization – when disease progresses, when emergencies happen, when dying will be a long process, the time of death, and when grieving begins. Each decision point is introduced with a research summary and an extensive case example that describes disease processes, health care delivery possibilities, and the end-of-life dilemmas involved so as to apply across the varying cultural, socio-economic, and spiritual contexts. The case example is followed by a clinical commentary written by a palliative care specialist, an ethical commentary written by an ethicist, and three short essays written by religious thinkers of different traditions. Each situation is concluded by remarks on potential approaches that respect religious and spiritual beliefs, values, and practices at the end of life across all contexts, and a bibliography. The five decision points are bookended by an introductory section that explores broad historical and cultural perspectives and a conclusion section that summarizes the book and provides guidance for further reading and study. From the publisher.